Parking: the streets to the immediate South and West of the church have disc parking limited to 1 hour. Parking discs are available from a table by the church entrance. The street to the East and further South is the High Street where parking is ‘Pay-and-Display’. These restrictions apply Monday to Saturday 8am to 6pm only - there are no restrictions on Sundays. ‘Blue Badge’ parking is allowed. The nearest dedicated disabled parking spaces are next to the bus stop in the High Street. One toilet has a baby-changing facility. Hearing: All Saints has a public address system and those conducting services use the microphones which are part of this. A ‘Loop’ system for hearing-aid users is also part of the system so that operating the ‘T’ switch on your hearing-aid should enable you to hear and fully participate in worship. Sight: All Saints has some larger-print service books and hymn books available on request. Larger-print versions of the weekly notice and service sheets and any hymn or song sheets required will usually be available. When the high altar is used for a Eucharist attendants will be present to assist at the steps in the choir area for reaching the altar rail and at the steps down into the vestry area for the return to your place. Anyone who wishes to receive Holy Communion but who cannot manage the steps or is unable to walk the required distance should ask for help when coming into the service and arrangements will be made with the person conducting the service for Holy Communion to be brought to you in your place. 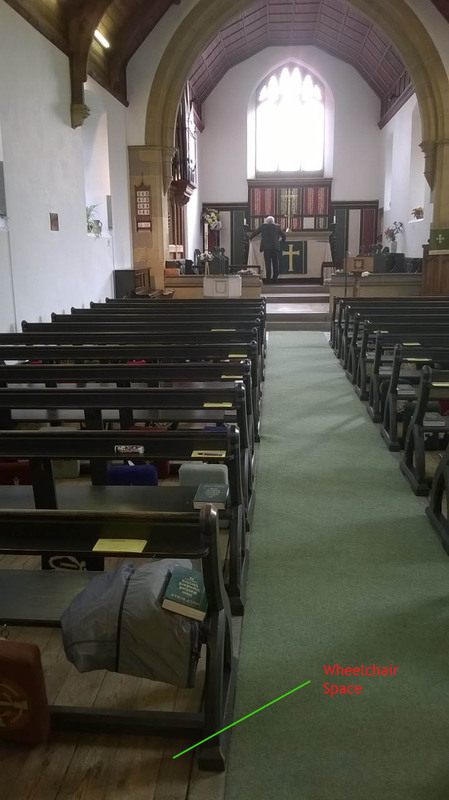 The same applies at less formal Eucharist services (3rd Sunday usually) when the altar is on the main floor level so that the distance is less and there are no steps.The Parlour entrance has a gentle ramp and manually-operated door requiring assistance for a wheelchair user. The floor area inside is flat. All internal doors are manually-operated and wide enough for wheelchairs - but see the note under ‘Toilets’. Parking: there are no parking restrictions or charges in the streets around St James Church. However St James stands at a junction containing a roundabout so that parking immediately outside the church is not possible as this would constitute an obstruction to traffic. Care should be taken to observe yellow lines and road markings. Hearing: St James has a public address system and those conducting services use the microphones which are part of this. A ‘Loop’ system for hearing-aid users is also part of the system so that operating the ‘T’ switch on your hearing-aid should enable you to hear and fully participate in worship. Sight: St James has some larger-print service books and hymn books available on request. Larger-print versions of the weekly notice and service sheets and any hymn or song sheets required will usually be available. 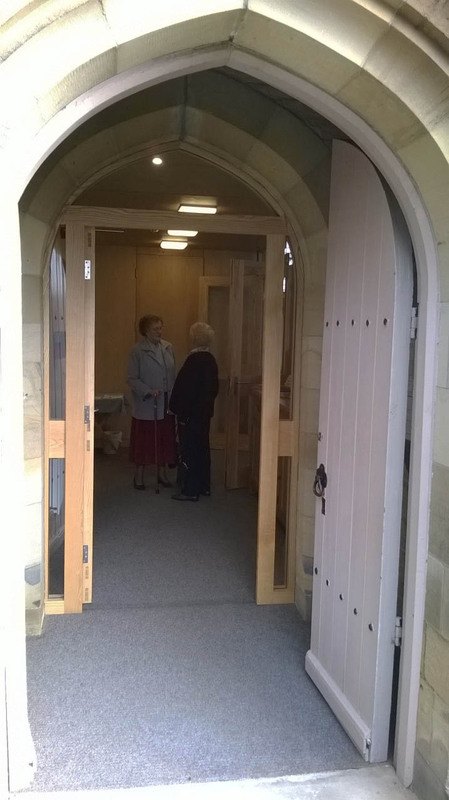 At a Eucharist attendants will be present to assist at the steps into the choir area and to reach the altar rail. Anyone who wishes to receive Holy Communion but who cannot manage the steps or is unable to walk the required distance should ask for help when coming into the service and arrangements will be made with the person conducting the service for Holy Communion to be brought to you in your place. 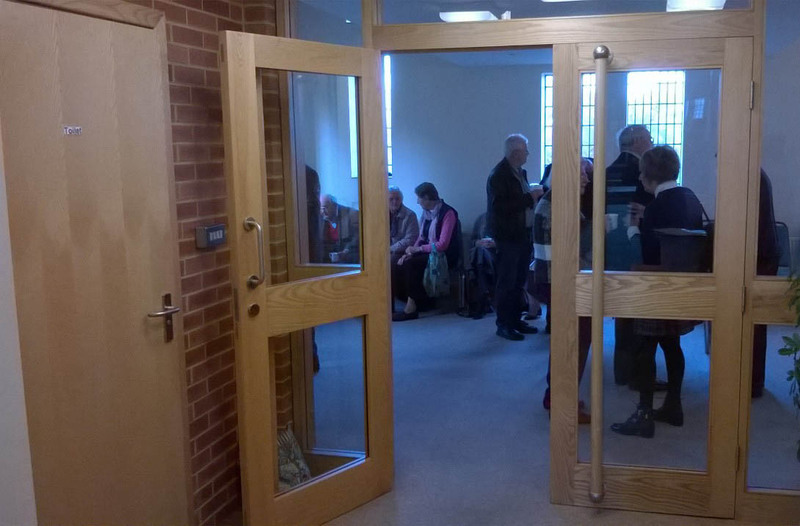 less formal Eucharist followed by light lunch held each 2nd Thursday at 11.30am takes place in the meeting room and there are no steps. Paths, doors and floors: St Lawrence is a very old church which was built without any consideration for those who might have difficulty getting to it. 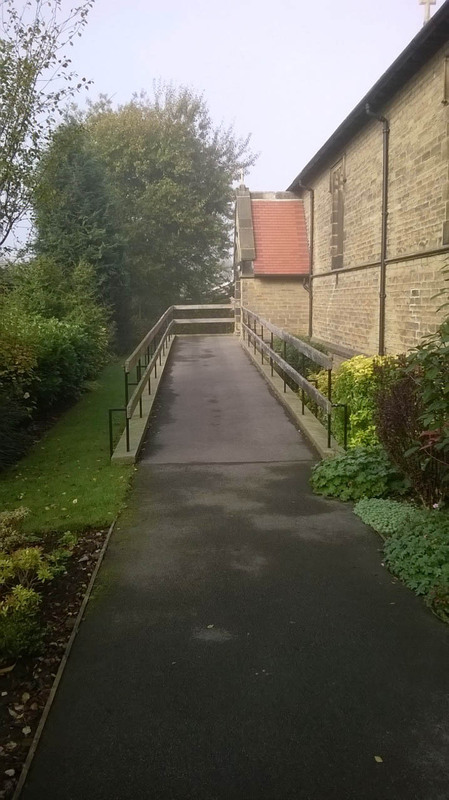 Access to the churchyard and the path to the church are not wheelchair-friendly. There are steps into the churchyard and on the path itself (with a handrail). The path is partially loose gravel and narrow as it nears the church. 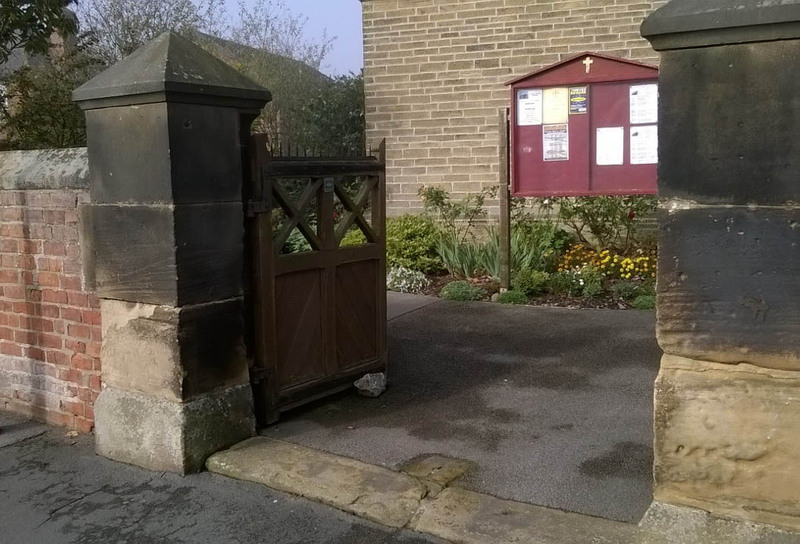 Photo It is hoped to make a more accessible entrance using the North door, but this will require some work and a separate path from the churchyard entrance. At a Eucharist church members will gladly assist anyone needing help with the steps into the choir area in order to reach the altar rail. Anyone who wishes to receive Holy Communion but who cannot manage the steps or is unable to walk the required distance should ask for help when coming into the service and arrangements will be made with the person conducting the service for Holy Communion to be brought to you in your place. Parking: the car park at St Lawrence is in the grounds of Kirby Sigston Hall. The surface is compacted gravel. Hearing: St Lawrence does not have a public address system or ‘Loop’ system for hearing-aid users. Sight: St Lawrence does not have larger-print service books or hymn books.